Urinary tract infection is one of the acute ambulatory care sensitive conditions, meaning if timely primary care were available for diagnosis and early treatment it could prevent the need for hospitalization. Among all children and youth 3 months to 17 years of age the hospitalization rate due to urinary tract infections was 30.9 per 100,000 children and youth in the population. The rate among girls is 3.6 times greater than that of boys. 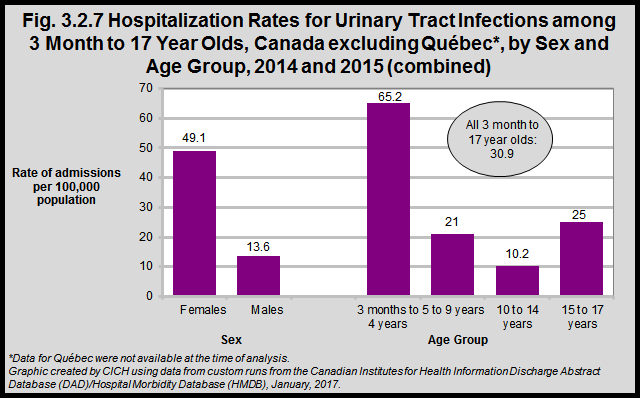 The youngest children (3 months to 4 years) are most likely to be hospitalized as a result of urinary tract infections (65.2/100,000) followed by teenagers 15 to 17 years (25.0/100,000).